Masumi Furukawa was born in Nagoya, Japan in 1972 and has worked as an illustrator and author of children's books since 2003. After she graduated in Comparative Literature from Nagoya University she went to Italy where she attended art school. Here she had the opportunity to develop her talent by studying a range of different creative art forms including painting, glass art, and childrens book illustration. In 2009 she was selected to participate in the annual Bologna Children's Book Fair illustration competition. Since her first book was published in Malaysia in 2003 she has had her illustrations published in childrens books in Korea, Japan, UK, USA, Taiwan and Malaysia. Through her books she hopes to provide a memorable message and to help children enjoy, and connect with, the imaginary world. 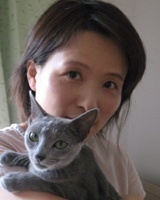 Masumi currently lives in Tokyo and enjoys going on trips, cooking, playing the classical guitar and spending time with her lovely grey cat!